The metallic look is definitely a cool one to pull off. Since it has been several years since it was last so popular, it will be interesting to see how people will adapt into their wardrobes. In the case of the metallic jumpsuits, I would wear that with black heels or booties for a party. It would even look good with the whole layering trend of wearing something underneath it. If I would layer it with any shirt underneath, it would be a black one because black goes better with any kind of metallic color than white. There were also some metallic blue and gold skirts that were on display which I would not buy because they are too long and I don’t have anything in my wardrobe that would look good with it. I prefer to buy shorter and maybe a solid color because there would be more flexibility to make an outfit with it. There were also a lot of sparkly pieces in the special occasion category and many skirts, which I thought were all so classy. 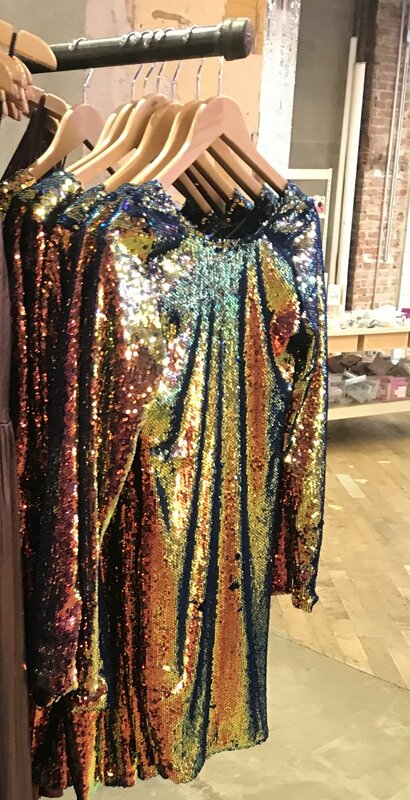 I think it would be cute to pair one of the sparkly mini skirts with an oversized coat for fall, especially one of the fur coats or even a cropped puffer coat. My favorite sparkly piece was the all sequinned dress because it shimmered and would definitely look good in pictures! Adding some sparkle to your outfit would be perfect for the holidays or a night out! We have all seen the wonders that velvet has done for us within the past seasons, so it’s no surprise that it’s back again at Urban Outfitters! There are some amazing velvet pieces. My favorite one that I saw was the rose pink romper because I think it would look incredible with tights underneath and some cute booties for the holidays. I went to try it on and the fit was very flattering and perfect in the waist. I was also impressed with the velvet tops and dresses too. 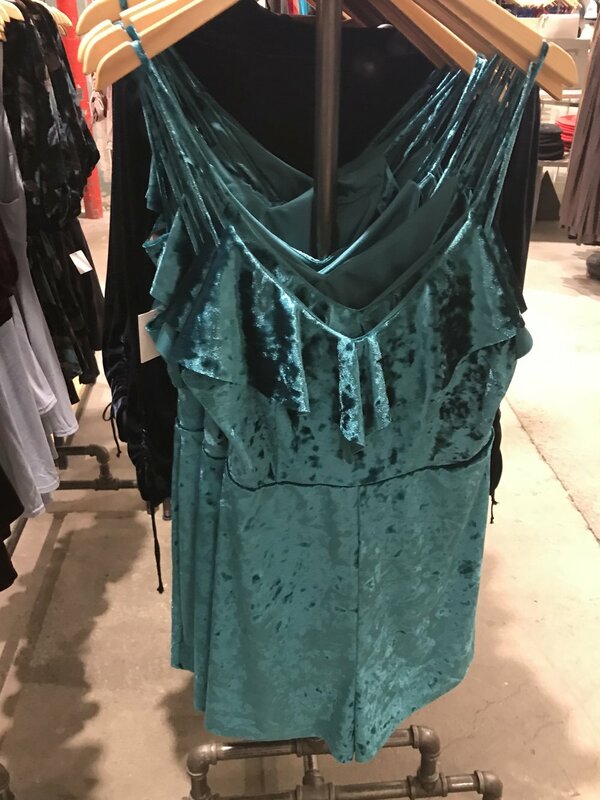 They had a velvet tank dress that you could easily work into the “layering look”. There was also a velvet set that I thought looked interesting, but I don’t think I could pull that off because it was just too much velvet head to toe. I came into Urban looking for a cute Pom Pom beanie, but ended up spending over an hour in the store looking at everything! I found the perfect pom pom beanie on sale in their cozy sweater section. I think it’s perfect for when the weather gets cold and just for a great fashion shot. I thought the pom pom wouldn’t look good, but it actually adds a lot to the outfit. I also bought a “Friends” graphic tee because I’m one of the biggest Friends fan ever (I’m currently watching it on Netflix for the fourth time now). So I thought it would be just silly for me not to get it! I also wanted just a basic graphic tee to wear because I don’t own really any. As I was trying on the Friends tee shirt, I had just grabbed a random pair of pants that I thought would look cool with the outfit, and it ended up matching so well that I bought the pants too! The pants are very unique and I could definitely get a lot of use out of them, wearing it with a casual, lounge outfit or dressing up with boots and a leather jacket!